I know my prayer life will never be the same after going through the 7 Keys for Answered Prayers. You have an awesome system to help people achieve their goals & dreams! Listening to the Prayer CD with Biblical Prayers has been very uplifting. I think these prayers are Powerful Prayers because they are praying God's Word. God always keeps His word! "The 7 Keys for Christian Success"
program and prayer always. thank you daddy." Many thanks for the 7 Keys for Christian Success. They are very motivating. I am a child of God who was originally astray but since 2004 I made a u-turn and, therefore, I intend to get closer to God. For this reason, I always welcome spiritual material because I know it's one way to help my spiritual growth. I intend to give these keys to my colleagues so that they also benefit like I have done. Keep doing God's work as you will be blessing more people. Stay blessed and I look forward to more. Listening has been a Blessing! I would like to thank you for the Prayer CD with the Christian Prayers that you have been blessed to make. I first bought "Positive Prayers for Spiritual Growth". Last week I purchased the Prayer CD with biblical prayers for Financial Blessings. Listening to these Prayer CDs have been a blessing in my life. I play them early AM - I wear my headset and listen also at night when I go to bed. Once again, thank you! A couple gets Financial Blessing! We are so excited. Our business has flourished. I know it wasn't just listening to the Prayer for Financial Blessings and praying with the prayer CD with the Bible Verses of Victory that made this happen. We applied the Keys on the Positive Prayers for Financial Blessings. We worked very hard. Praise the Lord for your ministry! As God blesses us, we will try to bless you and your family more. Inspirational Prayers with Prayer Power! I listen to the Prayer CDs with God's Favor and Blessings everyday. I'm still trying as hard as I can to get my business off the ground. I need to find one client mid size or larger. I'm trying everything I can do. Your Prayer CD with the inspirational prayers is my only saving grace so I don't have a break down. Praying God's Promises brings more Happiness! I was in a BIG depression... I now feel much happier from praying God's Promises everyday with your new system. They are very uplifting. Things have changed SO MUCH since I started praying to the Lord with these inspirational prayers. I received my order yesterday. I put my Prayer CD in the car and listened to the Positive Prayers for Spiritual Growth a bit yesterday - and also on my way to work this morning. My heart is already uplifted greatly. I would like to order another set for my friend. God has blessed me, and I really feel it will help me as I move forward. Peaceful listening with Prayer CD! Thank You!! I have really enjoyed Praying God's Word with the Positive Prayers and God's Bible Promises for the last 21 Days. I really love the background music too. It is very peaceful. I especially like track 6 on "receiving Financial Blessings." We are trusting God for our own home now. Praise the Lord! Prayer Power brings the Power of Prayer! I was heavily "backslidden". My life was totally on the wrong track. I decided to make a dedication. Instead of filling up my mind with "secular" music all the time, I began listen to the "Verses of Victory" with God's Bible Promises and biblical prayer. This alone has radically changed my life. I am so much closer to Jesus now. These Bible Verses are very inspirational and motivational for me. It is more of a "relationship" now. I am FOREVER grateful for these inspirational prayers!! Thank You so much for this Positive Prayer CD! Biblical Prayer with Prayer Power! Thank God for discovering your website and your ministry. I have been blessed tremendously through this opportunity to learn thus far. I am anxiously waiting for more inspirational prayer. The 4 Keys with Prayers for Spiritual Growth have helped. I appreciate the fact that your prayers and affirmations are backed by the bible. I love the idea of Christian Prayers and Christian Affirmations. I know Prayers and Affirmations work, but they are more powerful and easier to commit too when I know they line up with scripture. There are so many new age type prayers and affirmations that I didn't want. I thank you very sincerely for your service to mankind. God bless you and your Ministry. I wanted to share a testimony of much improved health. I love watching your prayer video for Health and Healing. All of your free Prayer videos on the Positive Prayers website have really helped me. Thank you for making them available. Your Keys for Health and Healing and weight loss are very easy and to the point. I have lost 12 pounds so far - and feel much better! Thanks also for what you are doing to spread the Good News! Thanks to You - a sponsored child! 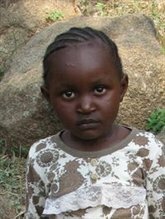 Because of your prayers and support, we were able to sponsor a beautiful little girl from Compassion International. Please keep Catherine and her family in your prayers. Thank You, and thank Jesus for love and compassion! We are praying to be able to sponsor more!